Russia Deploys Cruise Missile-Equipped Warship Towards The Two US Destroyers Which Struck At Syria - Joe.My.God. 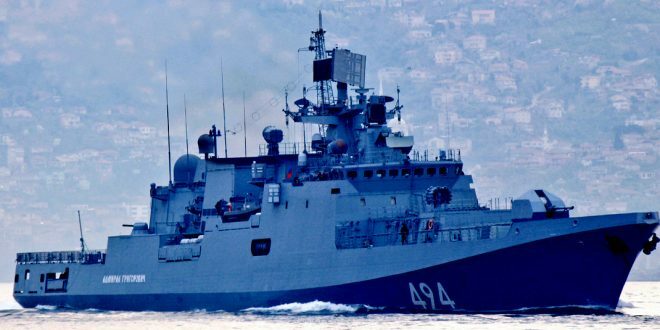 Russia deployed its most advanced Black Sea frigate Friday into the eastern Mediterranean, where U.S. Navy destroyers had launched an airstrike earlier that day against the Moscow-backed Syrian military. As Russian leadership condemned the U.S.’ first intentional attack on the military of Syrian President Bashar al-Assad since the country’s six-year conflict began, Russia’s Admiral Grigorovich frigate reportedly left its port of Sevastopol, Crimea, and headed toward the U.S. destroyers USS Porter and USS Ross. Russia’s 4,000-ton warship came equipped with Kalibr cruise missiles, one of Moscow’s latest and most deadly high-tech projectiles, and was headed to dock in the Syrian city of Tartus, according to Russia’s official TASS News Agency. The ship’s movement was also confirmed by Turkish ship spotter Yoruk Isik, who told the U.S. Naval Institute’s news agency that the ship had crossed the Bosphorus Strait only nine days after docking from a previous Mediterranean voyage.